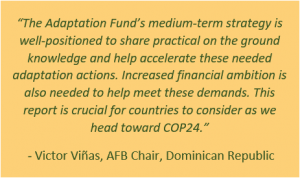 The Adaptation Fund (AF) will have a strong presence at the COP 24/ CMP 14/ CMA 1.3 United Nations Climate Change Conference this December 2-14 in Katowice, Poland. AF will feature a side event on adaptation innovation and scaling up effective projects, a multimedia exhibit on concrete actions for the most vulnerable showcasing its pioneering Direct Access modality, and a joint adaptation event for French speaking countries. It will also participate in high-level meetings, panel discussions and speeches alongside governments, implementing partners, NGOs and the private sector. Among the main tasks of the 24th Session of the Conference of the Parties to the UN Framework Convention on Climate Change (COP 24) is to reach decisions that ensure full implementation of the Paris Agreement. Under this year’s theme of ‘Changing Together’, the Polish COP 24 Presidency has conveyed that the UN must act together to halt dangerous climate change with efforts tailored to capabilities of individual countries. The conference will focus on sub-themes of climate-friendly technology, achieving sustainable transitions of industrial regions, reducing emissions through forests, land and water, and enhancing adaptation ambition. They closely resonate with AF’s COP 24 theme of ‘Accelerating Innovative Adaptation Together’ (#AFAdaptTogether). AF’s concrete, scalable actions to the most vulnerable are country-led, tailored to local adaptation needs, and inclusive with close engagement of local stakeholders. AF partners with governments, implementing partners and NGOs, and receives funding from a range of contributors – from national and subnational governments to individuals at the local level. 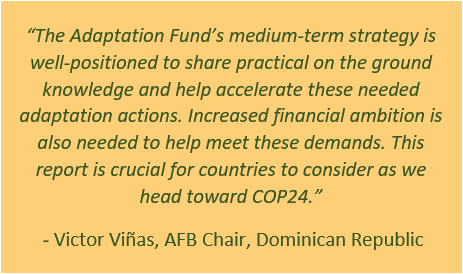 AF approaches COP 24 with rising momentum. It surpassed its single-year resource mobilization record last year with about US$ 95 million in pledges received. This June, the second phase of an Independent Evaluation gave AF’s project portfolio high marks for its efficiency, effectiveness and relevance. At its October meeting, the Adaptation Fund Board approved decisions to implement AF’s medium-term strategy to respond to the urgency of climate change by accelerating and enhancing the quality of adaptation actions in developing countries, scaling up innovative projects and disseminating knowledge of effective actions – all with an eye to supporting and engaging the most vulnerable groups. A new report in October from the Intergovernmental Panel on Climate Change highlighted the urgency to accelerate mitigation and adaptation activities to help avoid potentially “long-lasting or irreversible” climate impacts, including the complete “loss of some ecosystems”. AF projects are targeted precisely for those communities in developing countries that are most vulnerable to climate change. The first is to complete the process to formally serve the landmark climate Paris Agreement. AF has steadily advanced toward that end over the last few years, most significantly at COP 23 in Bonn, Germany last year when Kyoto Protocol members recognized AF’s concrete adaptation work on the ground for the most vulnerable and decided in a groundbreaking move that AF “shall serve” the Agreement. Further decisions are expected at COP 24 by the Conference of the Parties serving as the meeting of the Parties to the Paris Agreement (CMA) on governance, institutional arrangements, safeguards and operating modalities. 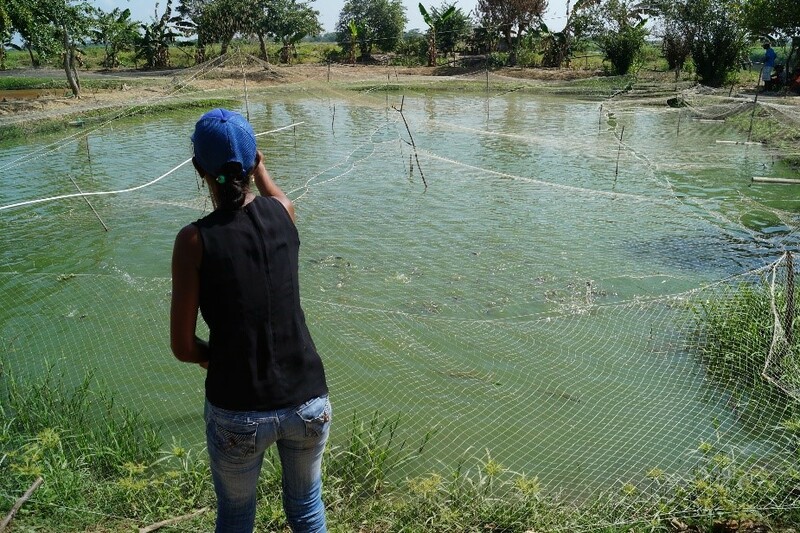 AF has already been contributing to the goals of the Agreement through its concrete adaptation projects on the ground, so becoming formally acknowledged to serve it would help more vulnerable communities in developing countries that the Fund serves to address the urgent climate needs they are facing. Secondly, AF has set a resource mobilization goal for 2018 of US$ 90 million to help it continue to meet growing demand for its work. It received a record US$ 264 million in new project proposals during its last submission period alone, and has an active project pipeline of over a quarter billion US dollars. Although AF receives a share of proceeds from sales of carbon emission reduction credits through the UN Clean Development Mechanism, it has relied largely on voluntary contributions since the carbon market dropped in 2011-2012. To date, AF has committed US$ 564 million to 84 concrete, localized adaptation projects around the world serving over 6 million direct beneficiaries. 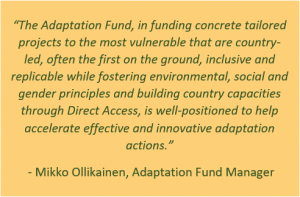 Individuals or organizations may also donate online to the Adaptation Fund to directly help vulnerable communities adapt to climate change.